Sharp and Bright: This black and white kitchen (by ALNO) exudes modern design with espresso hardwood flooring, light tan painted walls, a bi-level island with seating, and lighted-interior glass cabinets. More Pictures: This kitchen is located on page 7 of the modern Two-Tone Kitchens gallery (Kitchen #190). You should also enjoy photos of additional black and white kitchens in our contemporary photo galleries. Similar Styles: If you like monochromatic color schemes, you may also enjoy the gallery of Gray Kitchen Cabinets. For more information about this style, visit the article and photo collection on Contemporary Kitchen Cabinets. 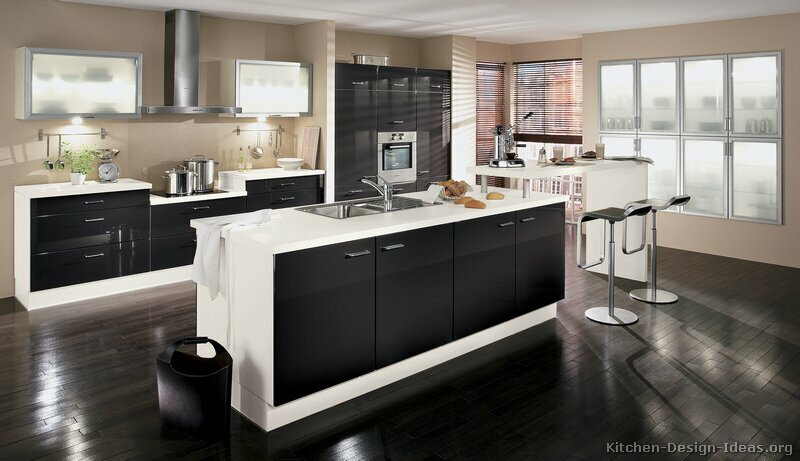 Daily Updates: To get Kitchen of the Day posts, visit Kitchen Ideas on Facebook and click "Like" to connect with us. Stay Informed: You should follow Kitchen Ideas on Twitter to see all the latest news and happenings with this site. We encourage you to subscribe to our free Kitchen Ideas newsletter as well.